CH Series check valves provide leak-tight control of back flow in instrumentation, alternative fuels, and small process applications where high pressure flow and cycle life are required. CH Series check valves are designed and tested to meet NGV 3.1 and ECE R110 requirements. 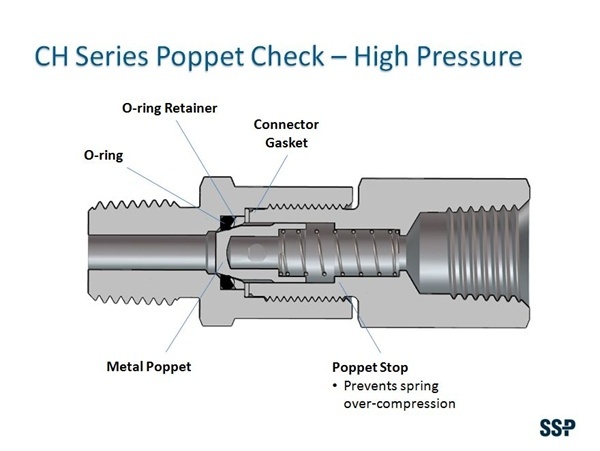 Select CH Series high- pressure check valves for your applications. Body Materials: 316 SS, Alloy 400 and Alloy C-276. End Connections: Duolok, Griplok and Unlilok tube end, male and female NPT and BSP pipe ends, and SAE straight thread pipe ends. CH Series check valves are 100% factory test for seal seal to 1000 psig (69 bar) and for cracking and realing pressure.